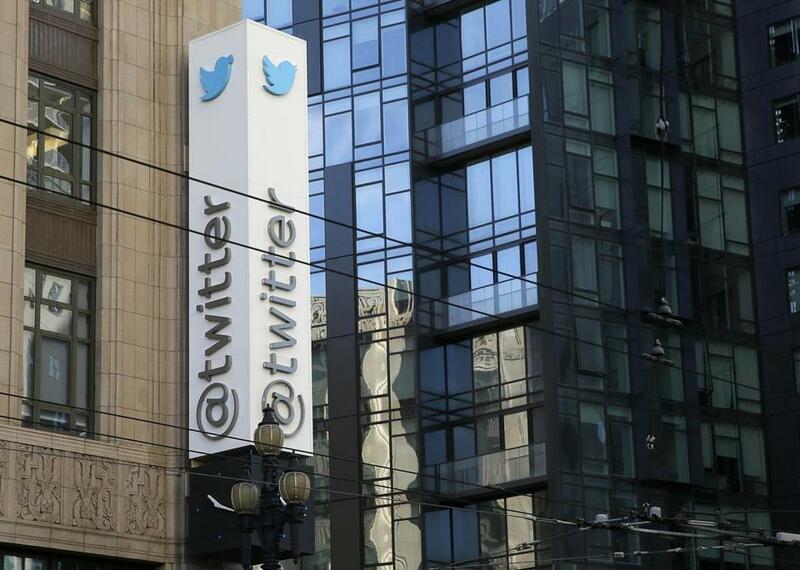 Twitter headquarters in San Francisco, Calif.
NEW YORK (AP) — Twitter beat Wall Street’s cautious expectations with its first quarterly profit in history, but that isn’t going to solve the company’s broader problems any time soon. The company isn’t alone in dealing with abuse, fake accounts and attempts by Russian agents to spread misinformation. But with its troubles compounded by a revolving door of executives and stagnant user growth, Twitter has been facing questions about just who is minding the store. Every time Twitter tries to respond to a problem, it’s either not good enough, or some other problem emerges. User growth has stagnated at Twitter, even as President Donald Trump’s no-holds barred tweets have attracted plenty of attention to it from around the world. Twitter faces stiff competition for people’s attention from much bigger and more established rivals like Facebook along with younger services such as Snapchat and Instagram. On Thursday, the company said it had an average of 330 million monthly active users in the final three months of last year, unchanged from the previous quarter and below Wall Street’s estimate of 333 million. In some good news for the company, Thursday’s results were stronger than expected. The company grew revenue by 2 percent to $732 million, above the $687 million that analysts polled by FactSet were expecting. Its net income — a first in the company’s nearly 12-year history — was $91 million, or 12 cents per share. Adjusted earnings were 19 cents, above analysts’ expectations of 14 cents. The company’s stock jumped 21 percent in pre-market trading. Like Google and Facebook, Twitter sent executives to exhaustive congressional hearings last fall to talk about how Russia used social media services to meddle with the presidential elections. And in a separate hearing, terrorism expert Clint Watts said Google and Facebook are ahead of Twitter in weeding out extremist content. He said that’s because Twitter relies too much on technology and not enough on threat intelligence and coordination with outside experts and officials. Twitter has also been dealing with white supremacists and others abusing users on its service and spreading hateful content. The company has enacted a slew of new policies around abuse, but enforcing them will be a bigger hurdle. Connor’s group recently helped two large Twitter and Facebook shareholders file resolutions asking the companies to take more responsibility for fake news, abuse and hate speech. The shareholders also want more information about how widespread the problems are and how the companies deal with them. The companies have not formally responded, though Twitter has introduced a slew of new measures to weed out abusive account and has said that it ‘‘cares deeply’’ about misinformation and its harmful effect on civic discourse. Then there’s the issue of automated accounts made to look like real people. In the days after a New York Times report on the ‘‘shadowy global marketplace’’ of brands and celebrities buying fake retweets and followers, prominent Twitter users collectively lost more than a million followers, suggesting that Twitter either didn’t know or didn’t act until the expose. Fake accounts aren’t a new problem for Twitter. Last June, Twitter said it has been ‘‘doubling down’’ on its efforts to weed out such accounts by ‘‘expanding our team and resources, and building new tools and processes.’’ It estimates that less than 5 percent of monthly active users are fake. But the Times referenced a report saying it could be as high as 15 percent. Twitter’s problem is exasperated by the fact that it is much smaller than Facebook and Google. Plus, Twitter is not doing as well financially, which can cause investors to give it less leeway on other problems. ‘‘Now (that) he’s gone, who’s running the company?’’ said Wedbush analyst Michael Pachter. You might say CEO Jack Dorsey, and you’d be correct. But Dorsey also serves as the head of payments company Square, taking advantage of the companies’ close geographical locations to split his time between the two. Thus Twitter, has ‘‘less than Jack’s undivided attention,’’ Pachter said, adding that nonetheless he runs the company with a ‘‘benevolent autocracy’’ that leaves little room for innovation. By contrast, Pachter said Facebook CEO Mark Zuckerberg ‘‘is not afraid if they alter his baby, his invention, to make it better,’’ even if in the end Zuckerberg may be the final arbiter.